Select A Project; Prepared scenarios should be associated with the projects that you have created in Testinium. When you select your project, the SELECT SOURCE FILE field in the number 2 spot will be filled automatically. Scenario Name; The name that you’ll give to your scenario. A Scenario of Suite; The scenarios that belong to the project are listed and selected in this area. The scenario of Order; You can create a working order for your scenarios. 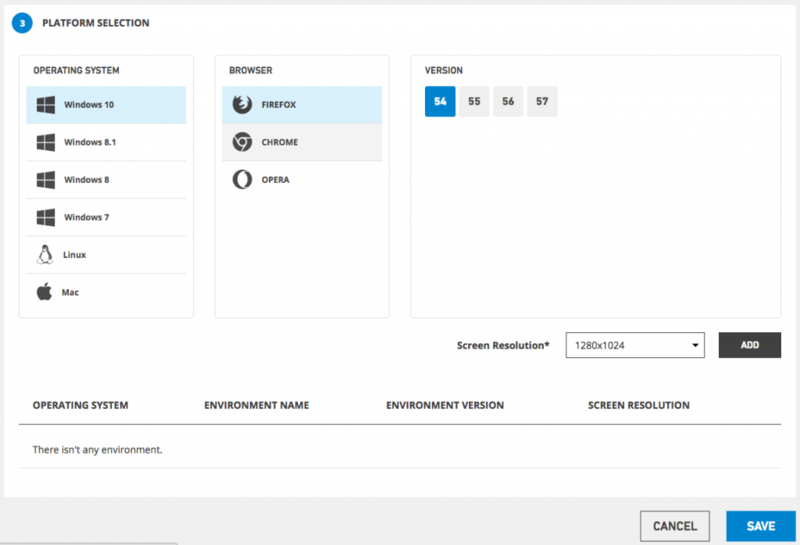 Platform Selection; You can pick the environment in which you wish to run your tests. The list will be updated automatically in accordance with web or mobile projects. There are many advanced settings in this step. Failed Test Retry Count; It contributes to the accuracy of your test results. You can run your malfunctioning scenario for any reason up to 3 times without splitting the stream in the test suite and you can be confident in the accuracy of the current bug. Parallel Test Limit; Your account’s parallel test limit can be allocated to Test Suites, so you can improve your productivity. Max Execution Time Per Scenario; You can set a max time limit for your current scenario runs and easily identify problems like infinite loop especially resulting from test code. They all have different bandwidth and network delay values. In case nothing is selected, by default Wifi is set to all engines. Screenshots; You can get screenshots of your test scenario steps automatically. 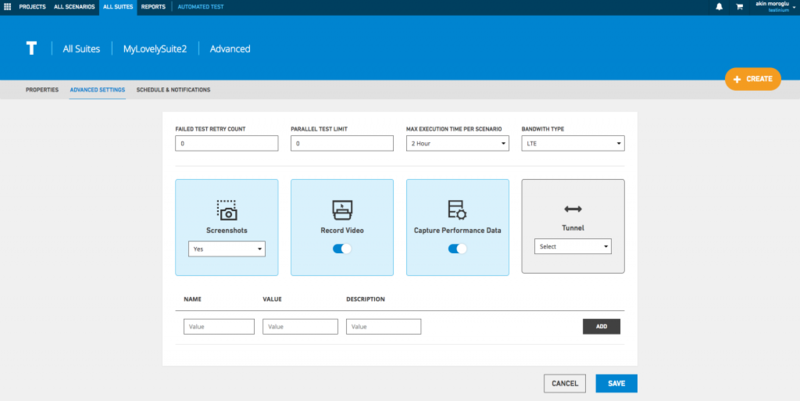 Record Video; You can automatically record a video of your test scenario. Capture Performance Data; You can gather reports on your pages’ performance metrics during test runs. In addition to all these features, you can assign a value from Testimonial interface to a dynamic variable that you will define in the test code. By doing so, you can execute more flexible test runs without changing your test code. You can run the test suites that you prepared manually or by setting a schedule. you can also get a smarter automatic run by entering the run period and day information. After the run, you can get notifications by e-mail and you can customize notification types according to the results of the reports.